Yearning toward a goal, picturing it in your head, pining away for all the things you wish you had, but in reality don't, can be a powerful motivator. Belief that one day you will take the next big step can inspire lots of little steps that help that hope become reality...or at least feel like it. 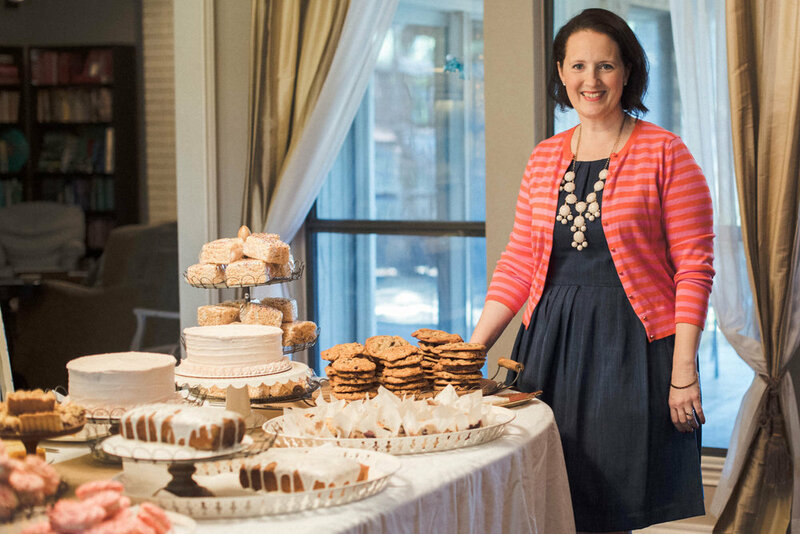 After two years of mixing and baking private orders from my home kitchen, delivering products to clients or meeting them in a parking lot somewhere, the business was running well. Lots of people start home business and take their product to their customers. But part of my desired "product line" involved creating an actual place for people. I wanted them to walk through the door and find something lovely waiting for them, a friendly face, a hot cup of coffee. I wanted them to want to come back. But where does one create space when there is not a place to house the space? Maybe I didn't have a retail store front, but I did have a home with a front door that opened directly into our dining room. And in this dining room was a table, the perfect focal point for gathering. What if I turned our front door into a store front and transformed our dining room table into a bakery counter? In the fall of 2015, with a double dose of bravery and belief, I launched Store Hours. Every Wednesday, in our home, from 9:00 to 2:00 I unlocked the front door and invited people to walk in to Hurley House. The table was piled high with cookies, cakes, bars, and pies. I offered complimentary coffee and a smiling face, and the craziest thing happened. People showed up. Moms and toddlers met for coffee and cookies and sat on my back porch while their little ones played on our swing set. Friends stopped by and chatted for a while. "Regulars" made us part of their weekly routine, and I got to know their children's names and hear about their lives. Wednesday Store Hours was a lot of work. Setting up, preparing the food, not knowing if anyone would show up...it was risky. Some weeks were slow, and my family had leftover cookies for days. And some weeks were full and busy. The experience showed me (once again) the power of hospitality. When we open our home, prepare space, welcome others in and anticipate their need, people feel taken care of. Hospitality is taking the risk to set the table and watch what happens. Store Hours was a shadow of big events on the horizon in the life our little company. Those Wednesdays became training wheels for the "real thing," a real store front, which was closer than I could have imagined, peeking just over the horizon. If you were one of those people who pulled into my driveway on Wednesdays, walked through my door without knocking, and took the whole thing seriously, thank you. You weren't just buying cookies and drinking coffee, you were fueling hope and supporting dreams. You were a balm that ran warmly over my heart, faithfully showing up and showing me this little dream had potential.